What is an HTTP POST Hook URL? Where can I find the HTTP POST Hook URL? In addition to manually triggering a Build within the MyGet User Interface, it is also possible to automatically trigger a Build every time code is pushed to your Source Control Repository, by making use of an HTTP POST Hook URL. 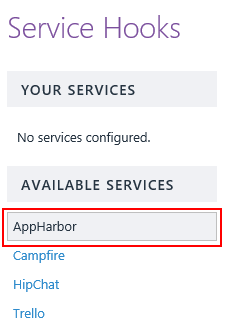 Note: When adding a build source from GitHub, BitBucket or Visual Studio Team Services, we automatically create a service hook trigger for you. Except if you disable this when linking a source code repository to MyGet, the hook has already been created and there is no need to do this again. Once you have fully configured a Build Source for your MyGet Feed, you will be able to manually trigger a build whenever you like. However, if you are trying to adopt the Continuous Integration Software Development Practice, then automatically triggering a MyGet Build whenever you push some code changes to your Source Code Repository is one of the first steps in doing this. The HTTP POST Hook URL is a mechanism to allow your Source Code Repository to notify the MyGet Build Service (via an HTTP POST to the given URL) when a commit has been pushed. As soon as this has happened, a MyGet Build will be added to the Build Queue, which will then go and grab the latest code from the Source Code Repository, and execute the Build. Note: MyGet Build Services has a 5 minute cooldown period between builds during which you can't trigger a build, manually or otherwise. Please contact MyGet support for more information about our dedicated Build Services offering to avoid this cooldown period. The HTTP POST Hook URL is clearly visible on this page (the GUID at the end of the URL has been obscured simply because this is unique to each Feed). 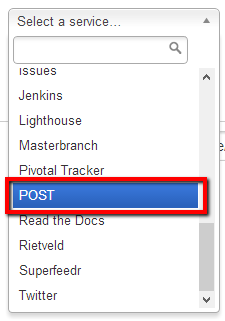 Click the copy button (indicated by the arrow) to grab the URL ready for adding into your Source Code Repository. 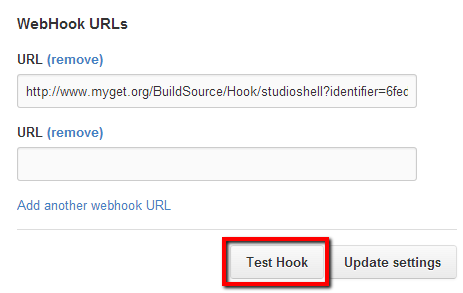 Note: When adding a build source from GitHub, we automatically create a service hook trigger for you. Except if you disable this when linking a souce code repository to MyGet, the hook has already been created and there is no need to do this again. We recommend using alternate API keys for every sync relation. The following 6 steps provide information about how to use the MyGet HTTP POST Hook URL within a GitHub Repository. Using the form that appears, paste in the HTTP POST Hook URL that was copied from MyGet above into the URL field and click the Update settings button. Make sure to select the application/vnd.github.v3+json hook type! To verify that this has been set up correctly, you can then click the Test Hook button. Doing this should trigger a Build straight away within MyGet. Note: When adding a build source from BitBucket, we automatically create a service hook trigger for you. Except if you disable this when linking a source code repository to MyGet, the hook has already been created and there is no need to do this again. The following 6 steps provide information about how to use the MyGet HTTP POST Hook URL within a Bitbucket Repository. At this point in time, there is no automatic way of testing to ensure that the URL that you have entered works correctly. In order to achieve this though, you can follow the Troubleshooting Bitbucket Service page on the Atlassian Wiki. In addition, make sure to add comments on the issue that has been raised to add this feature to Bitbucket to show that it is popular. The following 6 steps provide information about how to use the MyGet HTTP POST Hook URL within a CodePlex project. At this point in time, there is no automatic way of testing to ensure that the URL that you have entered works correctly other than commiting code to your CodePlex repository.